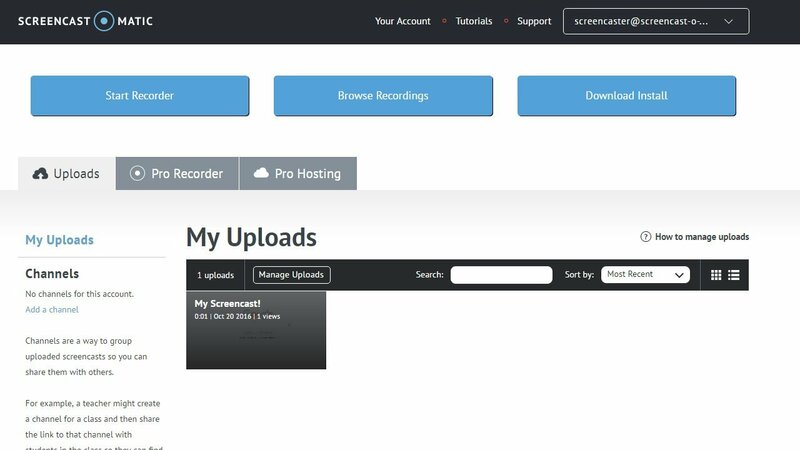 0:00 When you upload a recording to Screencast-O-Matic.com you can embed the upload for playback on another site using an embed code. 0:07 First find the recording you'd like to embed in your list of uploads at Screencast-O-Matic.com then hover your mouse over the recording and click on this icon. 0:17 This will bring up a box which shows embed code options for this upload. 0:22 First you would select a size for your embed. We offer some standard sizes in this dropdown or you can choose "Custom" to enter a custom width for the embed. 0:32 After choosing a width you can copy the embed code shown in this box by right clicking your mouse and choosing "Copy"	0:39 Here's an example of what the default embed will look like with FREE hosting after you Paste the code into your site. 0:46 If you have Pro Hosting then the embed will be shown without the Screencast-O-Matic logo. 0:51 You have some advanced options if you'd like to customize the embed further. 0:56 You can choose to hide the title by clicking this box. 1:02 You can choose to show the controls in your embed before playback starts. 1:10 You can choose to turn captions on by default if there are captions included with the upload. 1:16 And if you have Pro Hosting then you also have the option to autoplay the embedded video when the page loads. 1:22 As before after clicking on the options you'd like to use you will still need to copy the code here and paste it into your blog or website HTML.